A study in the British Journal of Sports Medicine last month ranked United States children among the least fit in the world—the US ranked 47th out of 50 countries in physical fitness of our children! With a sedentary lifestyle linked to heart disease, diabetes, and obesity, it is more important than ever to get our children moving and instill healthy behaviors that will last a lifetime. It’s been shown that children whose parents exercise regularly are more likely to exercise and be active as adults. Exercising together is fun and more motivating for both parents and their kids. A good physical fitness program includes a variety of exercise and movement activities. Pilates is just one of many exercise methods that is gaining popularity among adults, and with its focus on core strength, stability, and body awareness, this exercise method can be used with kids too–and with great benefits. And since many Pilates exercises use body or limb weight for resistance strengthening, little to no equipment is needed. So grab a piece of floor and perhaps an exercise ball, and have fun while being active with your kids! Pilates Bridge is an exercise that strengthens gluteal (buttock) muscles and hamstrings, while providing a stretch to flexor muscles across the front of the hips. It requires core muscles to work together, leading to good posture and balance for all future dancers, gymnasts and sports enthusiasts. To make it fun for kids, help them place feet (and lower legs if more support is needed) on an exercise ball and lift hips and spine off the floor. Weight should be on the shoulders and feet. You can stabilize the ball if needed, or have the child wedge the ball in a corner before starting. Swimming Exercise strengthens extensor muscles of the back, hips, thighs and calves that kids need for running and jumping. Lying flat on the tummy, have the child lift one arm at a time, keeping the legs straight and long. As the child gets stronger, cue him to lift one or both legs off the floor , always keeping them stretched as long as possible. Younger children might need help stabilizing one arm against the floor while they lift the other. Make it fun by pretending to be an alligator chomping on his dinner or reaching for small objects. Pilates Leg Circles are hard for many adults, and even harder for young kids who lack abdominal strength to stabilize the trunk while moving their legs above their body. But working on the starting position for this exercise will help kids learn to engage abdominal muscles prior to moving their legs when climbing or kicking a ball. Ask the child to lie on his back and lift his feet above his body (hips at a 90 degree angle). Make it fun by placing small bean bag animals on his feet or ask him to squeeze the animals between his feet. Plank strengthens core muscles that are critical for a stable, balanced body, whether your child likes to exercise on the playground or by playing a competitive sport. The key with plank is to only hold the pose for as long as you can keep good form. Give your child the support of an exercise ball to start, bringing her forward onto her hands. Keep the ball positioned under the hips if needed; move it to the lower legs as the child gets stronger. She should be able to keep her tummy lifted and the back straight (not arched or sagging). As soon as the trunk starts to lose its form, take a rest and try again after a minute or two. Make it fun by singing a song while holding the plank position. Proof that Pilates exercise can be used by everyone, many Pilates moves have been adapted for use in rehabilitation. Pilates is used to rehabilitate orthopedic injuries in adults as well as to strengthen and improve body awareness for children with neuromuscular disorders. Easter Seals DuPage & Fox Valley therapists are expanding their knowledge of using Pilates in therapy with a continuing education course taught by Sara Koveleski Kraut, DPT, on January 21-22, 2017. The course is open for registration by adult and pediatric therapists at eastersealsdfvr.org/ce. Easter Seals DuPage & Fox Valley is also a teaching center that provides innovative continuing education courses that promote therapeutic excellence for speech and language pathologists, physical and occupational therapists, educators and other professionals. To be added to the course email list, please email us. Could Changing our Thinking about Ankle-Foot-Orthotics (AFOs) Help Children Walk Better? This is a question many in the pediatric therapy world have been pondering and practicing for a number years. Elaine Owen, MSc SRP, MCSP has completed quite a lot of research through her work as superintendent and clinical specialist physiotherapist at the Child Development Centre in Bangor, Wales, in the UK. Through her careful study of the gait cycle, she has inspired us to think differently about the way the segments of the foot and leg are aligned at various times in the cycle, and she encourages us to replicate normal gait more closely through the use of not just an AFO, but AFO/footwear combinations. The Old Paradigm: 0 degree plantarflexion AFOs and Flat Shoes. Photo from Beverly Cusick. In her paper The importance of being earnest about shank and thigh kinematics especially when using ankle-foot orthosis, Elaine points out that contrary to the common belief that the lower leg is vertical at midstance (the way many solid-ankle AFOs are designed), the lower leg is actually inclined 10-12 degrees at this time in the gait cycle, and this inclined position places the knee joint over the center of the foot, which provides stability in single limb stance. This information begs the question, are we actually causing more work for our clients, as they struggle to move their center of mass forward over an unnatural vertical lower leg position? Could we increase efficiency and more closely approximate normal gait by adjusting the pitch of the AFO at midstance through the use of specific footwear or external additions to the brace? Beverly Cusick, PT, MS, COF/BOC has done much to bring this, among other current concepts, to the attention of practicing pediatric therapists and orthotists. In her paper, Help Patients Manage Equinus Deformity, Use Orthoses to teach children to optimize body weight carriage on the feet, Ms. Cusick describes a paradigm shift in brace design for children whose ankles are plantarflexed (toes pointed downward) while walking. In addition to the concepts brought to light by Ms. Owen, Ms. Cusick considers the sensory benefit of gaining full heel loading in the brace as an essential component of the effort to improve postural control in standing and – when feasible – walking all day long. Modified AFOs combined with modified footwear can provide the wearer with a strong biomechanical training tool. To get acquainted with these concepts, click on the references above and the Progressive Gaitways, LLC website: www.gaitways.com. Friday, May 20, 2016 Click here to register and for more information. Saturday, May 21, 2016 Click here to register and for more information. For more continuing education information including the course schedule, please visit: www.eastersealsdfvr.org/continuingeducation. Pediatric therapists have been known to use every one of their own limbs to assist children to align their bodies and move successfully. When the therapists run out of hands and feet, they turn to additional supports for help—adjuncts like therapeutic tape, elastic wraps, and compression garments. 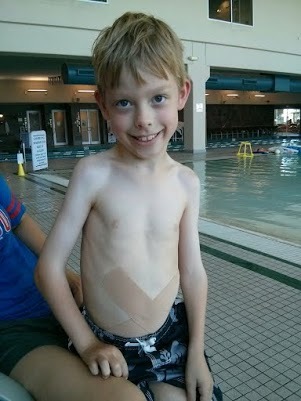 Elastic tape over the Abdominal Oblique muscles helps this 8-year-old with Cerebral Palsy to activate the muscles that keep his ribcage and pelvis stable. 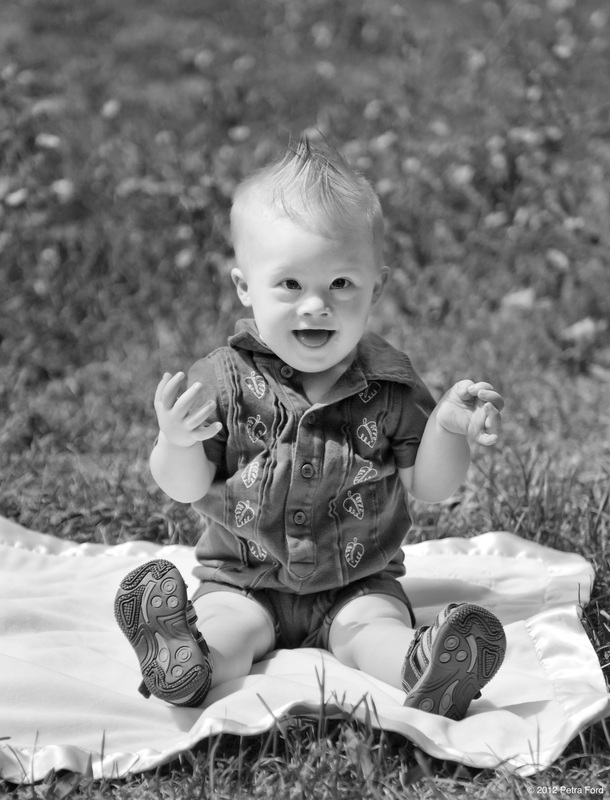 This helps him sit with better balance and move his legs more easily while stepping. Elastic tape (Kinesiotape and KT Tape are 2 well-known brands) has long been used in the sports and fitness industry to relieve pain and support muscles and joints. 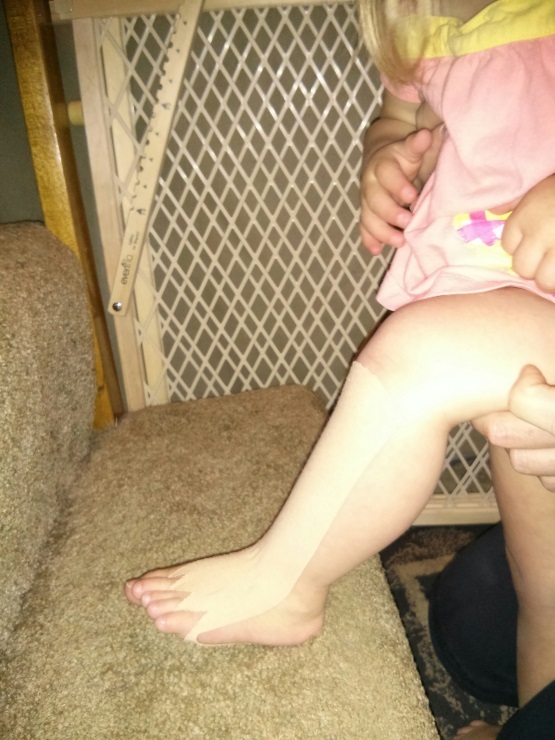 Now therapeutic taping is used with children as well, often to assist a weak muscle to work better or to re-align a body part so that the muscles can work more effectively. 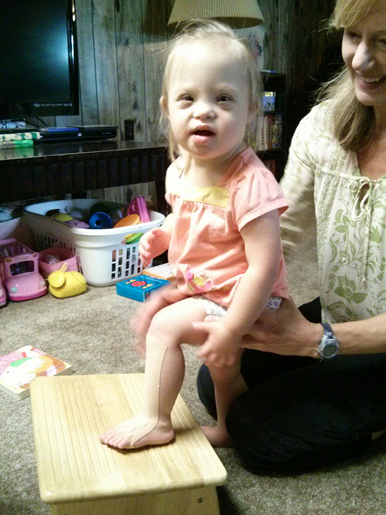 Tape that is stretched over the Tibialis Anterior muscle helps this 2 year old with Down Syndrome lift her toes in order to step up stairs. Active exercise using the tape-assisted muscles is important to “re-train” the muscles to function in their new alignment. This helps the child practice using the muscles properly in functional tasks. Parents can maximize progress by building in practice throughout their daily routine, as one application of tape can be left in place for up to 5 days at a time. 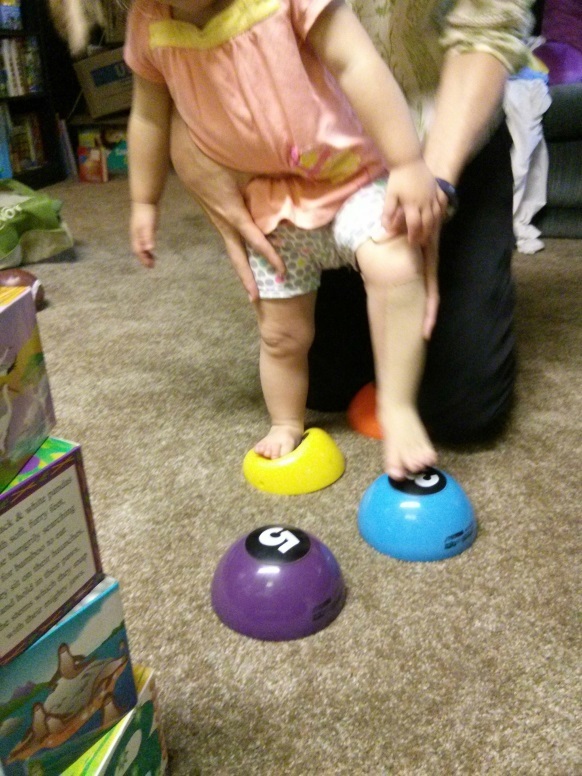 Stepping on targets such as soft stepping stones is a fun activity to practice lifting the foot while the tape assists. Fabric straps that stretch in two directions can be used to help align upper or lower limbs. They are particularly useful to bring the arm or leg toward a neutral position when it is rotated too far inward or outward. A physician and therapist must carefully assess that there is not a structural (bony) reason for the position of the limb prior to using wraps in attempt to change alignment. Compression garments, such as those made by Spio and Benik, are flexible articles of clothing that provide deep pressure sensory input as well as assist the wearer to returning the body to a mid-line position. Prone without supportive garments—this one-year-old with low muscle tone has difficulty accessing abdominal/gluteal musculature to anchor her pelvis on the floor, resulting in weight pitched forward on her chest and arms and inability to use arms for play. Prone with compression garments—improved ability to use abdominal/gluteal musculature to stabilize pelvis to floor allows weight to shift back off of chest and arms. 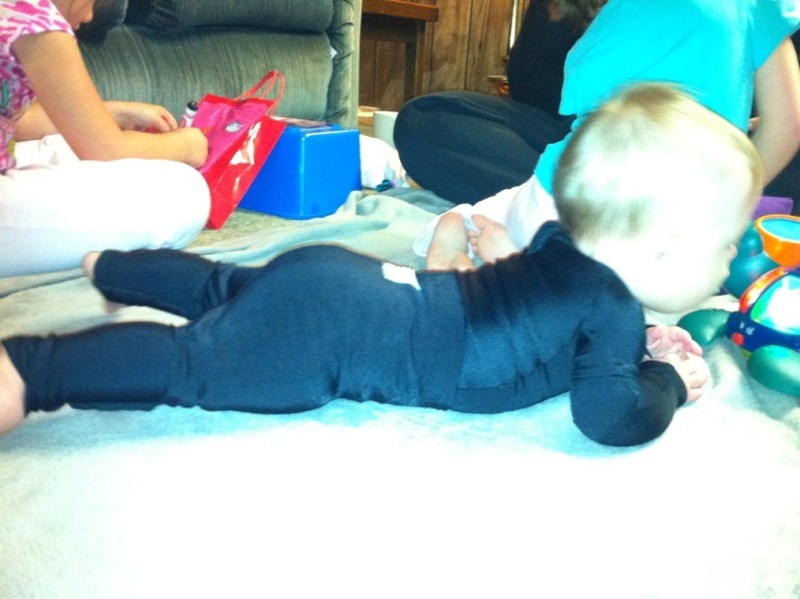 This allows the child to begin to practice shifting her weight to lift one arm to a toy and eventually crawl forward. Therapeutic tape, wraps and compression garments are helpful adjuncts in therapy and to assist children with alignment that allows them to activate weak musculature throughout their daily routines. Easter Seals DuPage & Fox Valley therapists are expanding their knowledge of using these beneficial tools through a continuing education course taught by Patricia Martin, PT and Audrey Yasukawa, MOT, OTR/L on September 18 & 19, 2015 at our Villa Park center. For a full list of continuing education courses visit: http://eastersealsdfvr.org/ce. Why Treat the Rib Cage? When I went to Physical Therapy school, the entire unit on respiration and the musculature that supports it consisted of a self-study chapter. With so little importance placed on this subject in school, I was surprised to see what an impact treating the rib cage has on my pediatric clients. Learning about the way the rib cage changes in structure and function through normal development, and then what happens when a baby is born prematurely or has poor trunk strength, was a big eye opener for me. Delving into this topic, the most important thing I realized is how rib position could affect not just breathing, but so many other areas of development, including motor skills like sitting, dressing and talking. The ribs are connected to the spine and need to move properly in order for the spine to move in all directions—we all know spinal movement is needed for everything from sitting up straight to swinging a baseball bat. The rib cage is connected to the shoulder via the collar bones and shoulder blades. The ribs need to move downward after infancy in order to allow the shoulders to work properly for activities such as reaching overhead and dressing. Normally, a baby or child can change his breathing pattern when the body needs more stability for difficult tasks or when he needs to breathe faster under stress. If the ribs do not move normally or are not in the right position, the child will only have one breathing pattern and might learn to hold his breath to gain stability. The lower ribs need to move inward when lower trunk musculature contracts to produce an effective cough, which clears secretions from the lungs and upper airway. When mucous is not cleared from the lungs, it can become infected and cause a pneumonia. When trunk musculature is working properly to contract the rib cage with control, airflow over the vocal folds is controlled in such a way that allows the ability to produce sounds properly for voicing. Normal development of motor skills that typically occurs from birth until the age of 2 facilitates the muscle lengthening and strengthening that moves the ribcage into its mature position and provides effective breathing patterns for the child. When motor skills develop atypically, muscle lengthening, strengthening, and rib mobility must be provided by a Physical Therapist, Occupational Therapist, or Speech-Language Pathologist trained in this type of therapy. The therapist must also instruct parents in exercises to do at home for the very best result. The therapy staff at Easter Seals DuPage & Fox Valley are invested in learning more about this frequently overlooked area of treatment and are hosting a continuing education course this month to expand our skill base. Click here to learn more from Rona Alexander, PhD, CCC-SLP, BCS-S, C/NDT.